I was diagnosed with type 1 diabetes when I was 9 years old and it was one of the hardest things for my parents and family members to wrap their heads around. My parents battled internal blame and guilt, and my siblings didn’t know if playing with their little brother would ever be the same. As for me? I distinctly remember courageously nodding at my doctor and accepting my new challenges as they explained how I would have to change my diet, prick my finger multiple times a day, and give myself insulin shots regularly. Believe it or not the only thing that got to me was the idea of drinking diet pop… I hated diet pop. Maybe I was naive, but my diagnosis was a way to stand out from the crowd. All throughout school my T1D defined the person who I was, and I sort of liked that. I made sure to inform all of my teachers and friends that I had diabetes. If my friends were extra nice to me on certain days, I would even offer them some of my candy that my mom made sure I’d bring to school with me in case my blood sugar went low… (sorry mom, thank you for helping me make friends easily though). Being so open about my diabetes really gave me confidence to talk to more people (it’s a great conversation starter to be honest) and involve myself with groups and clubs that I otherwise may not have. 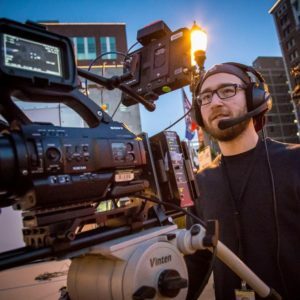 My confidence in speaking to people lead to me becoming very involved with my school’s media production classes, creating videos and serving as an anchor on our news program. The more involved I became, the more I knew what I wanted to do for the rest of my life. As a recent graduate of Michigan State University, I am fortunate to work for my alma mater as a Production Technician for WKAR-TV right inside the heart of the College of Communication Arts and Sciences. Working in television production can be incredible and terrifying at the same time, which is one reason why I love it so much. Each day can be different when you have T1D, so I’ve made sure to inform all of my co-workers and even student interns of my diabetes. In doing so, I am able to act quickly and efficiently to make sure I am on top of my health and my work accordingly. Despite my efforts, occasional low blood sugar alerts or my pump reminding me to change my site happen. I’ve had only a handful of instances where my insulin pump or CGM for my blood sugar levels have interrupted an interview or recording. Most often the timing of the interruptions is quite ironic (and hilarious). 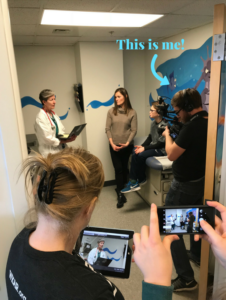 For example, WKAR has recently teamed up with the My1DHero team to create segments about the MyT1DHero app and the research that Dr. Bree Holtz and her team is conducting in the College of Communication Arts and Sciences. When I first heard of the collaboration, I knew I had to be a part of the project. While recording one of our interviews with a nurse practitioner in a hospital, my blood sugar decided to crash and my CGM alerted everyone in the room with its high pitched alarm. Of course, trying to be as little of a burden as possible, I reassured everyone in the room that I was fine, but as soon as I asked for a juice box, our interviewee was out of her seat to grab me one. She was completely unbothered by the interruption. Had I not mentioned that I was diabetic prior to recording, it could have been a much bigger issue than what it was. I must admit, if there were an ideal time for my pump to interrupt an interview, being with a nurse practitioner who has studied diabetes and was there to be interviewed on the subject was it. As I continue working with WKAR and the College of Communication Arts and Sciences, it is nice to be involved in a project like this. I am getting the opportunity to meet kids with diabetes and, in a way, show them that diabetes should not hold you back from what you love to do. I am fortunate enough to be able to do what I love every day, and I have never let my diabetes interfere with that. Bubbers you are one of a kind and I love you. hey bobby ray you are an awesome awesome young man and I love you dearly. Very inspirational bobby, glad to see you’re doing well and living life to the fullest! Bobby, I remember those early days after your diagnosis and how brave and pragmatic you were about your disease even at 9. I was so glad that your sister was with you that first year in the classroom. Your family was so supportive! I never had any doubt that you would succeed at whatever you set your mind too! Love it Bobby! Go Green! I sure hope my daughter learns to listen to her alarms like you do. She was diagnosed at 8-months old, and is 9-years old now. I continually see her ignoring her Dexcom and pump alarms which infuriates me and terrifies me at the same time. I know she’s got a lot on her shoulders but I feel this isn’t something to take lightly, and eventually won’t have me or her health aide to watch out for her.